Well said Ed, as always. This is the hour we’ve been hoping for! What’s interesting to me is that we question the tools of technology at all. The telephone has only been around around 100 years or so, but I don’t see anyone questioning the need to “invest” in good communication tools. It’s not considered a good or a bad thing, merely a tool that one uses as much as anything else, with the same amount of risk/investment planning involved. My question is when will we get to the point that we stop structuring the conversation as if IT is anything more or less than a tool, one that we use to accomplish a goal? When will we get to the point that its not its own separate little kingdom but merely another department in the company? “Demonstrate ROI through IT’s transformative and innovative power.” What power?? 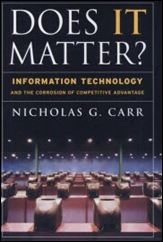 You missed the point of Carr’s work, and you obviously have not read :What Google is doing to our Brains (the Atlantic), and his new best seller “The Shallows”, that details the neurophysiological basis of the IT adverse effects on human kind and thinking. The technology is the commodity, it’s how you leverage it to generate and manage information that counts. That is, it’s the information, stupid. A BIT fuzzy??? On a scale of 0 to 10, where 0 is unknown and 10 is certain…I’d say it’s maybe a 3 or 4. Ed, you nor I, have any idea where this is all going to end up in 5 years. It’s not fuzzy, its a San Franciso fog! I also understand that the term ‘back office’ can be alittle demeaning. Hey, it conjours up images of when the CIO routinely reported to the CFO, and we all know that no CFO ever had any idea of how to run IT. But lets not forget that IT is a SUPPORT function, hospitals should not be in the business to ‘grow or sell’ IT. That does not mean that IT cannot strategicaly contribute to the overall organizational goals, but so can housekeeping, dietary, and all other support departments. Michelle W: There is a huge difference between IT and a telephone. Even though many people these days refer to IT as a “tool”, they are wrong. Yes, a phone is a communications tool, but IT is a medium from which many kinds of tools can be fashioned, given the right vision and specs and skills (and funding, of course). In fact, it’s because of IT, via add-ons, that phones are finally moving beyond the narrow restriction of basic communication tools. Hardware and software are tools only in a very general sense, but they actually represent an entire warehouse full of tools, the best of which have yet to be devised. It’s an evolving and growing process that requires much analysis, experimentation, and tons of patience. When desktop computers first hit the open market (late-70s), we barely knew what to do with them. There was common conjecture about using them to store recipes and addresses, and of course to play games. In fact, in about 1979 I worked with a physician to devise a simple billing system for his office. The best we could produce was an application that took a name from the address database and printed it on an invoice with correct amounts. Believe me, that was a big achievement for the day, but it was never trouble free. That doctor’s frustration sounded exactly like what we hear today concerning the larger systems. So, it seems to me that we’re moving one step at a time down a path toward ever increasing benefits, which makes it more than just a tool on the shelf, but rather a medium for potential break-throughs to better business and patient care. It takes a lot to get there, and as we do, we keep raising the bar, as we should. That sounds, to me, more like a creative canvas than a mere tool like a phone. That reminds me of Jerry Mander’s “Four Arguments For the Elimination of Television” (1978). I actually agree with Mander on all points, but no way is that TV going back in the box. That ship has sailed, as they say, and best we can do now is try to minimize damage. not tired, your argument might be a little less hypocritical if you mailed it to us instead of posting it on the world’s largest IT network. Glad to hear Carr has been challenged, although his new book, “The Shallows”, is fairly true to form. Re: Objection. Thanks for the well-written response, it gave me much to think on. I agree in the sense that yes, of course, IT is more a system than one specific tool. I probably oversimplified too much in my comment. But as you mentioned with phones, what we call a “phone” today is far beyond what Dr. Bell originally produced. It was considered a novelty device but grew to the point that now, with the aid of other technologies, it is becoming the major mobile computing platform of choice. Even before cell phones, we had call-waiting, answering machines, 1800 numbers, phone trees: many people still use dial-up Internet, which is run through phone lines. Yes, a phone can merely be a means to call someone. It call also be much, much more, as business and industry have found. My point? Information Technology offers an amazing amount of opportunities, but is still, at its heart, about utilizing these tool(s) (in whatever form it appears) to achieve certain goals. Whether my goal is to deliver quality health care or a photo blog, IT in and of itself is not going to get me there. I can use many different tools to get the job done, both high and low tech, but at the end of the day, these are investments in time and money I make to supplement and/or boost skills I possess. I’d just like to see less alarmist warnings/prophecies and more practical approaches to the idea that we are a race that has used technology in one form or another since are beginnings. Perhaps I’m drawing on a monitor instead of a cave wall, with a mouse as opposed to a bone. Which tool I use is a matter of what I am trying to produce. In regards to other comments and the repeated warnings about how technology is making us dumber, I defer to this blog post over at KevinMD.com, which is one of the better explorations of the issue I’ve read. This does not apply to hospitals, as hospitals are not in the R&D business, but hospitals could leverage the R&D side of HIT far better than the do, that is, the Medical Informatics field – in the formal sense such as these organizations and others where formal research and rigorous education is done.